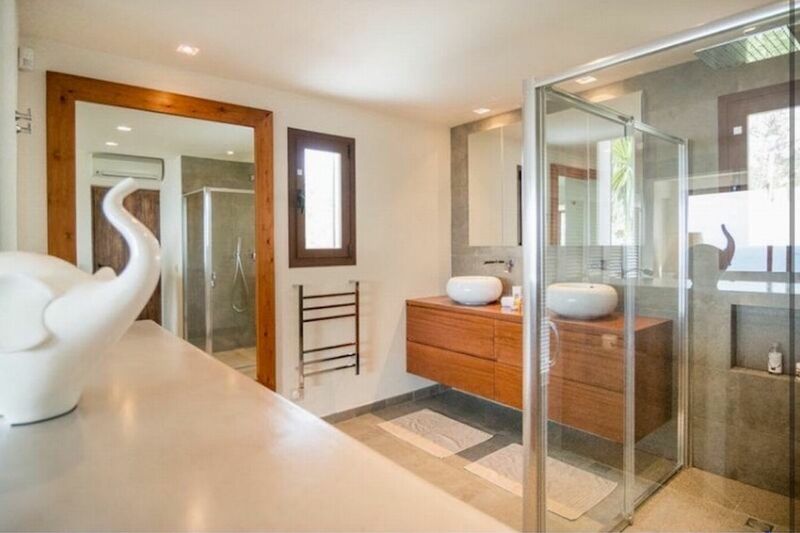 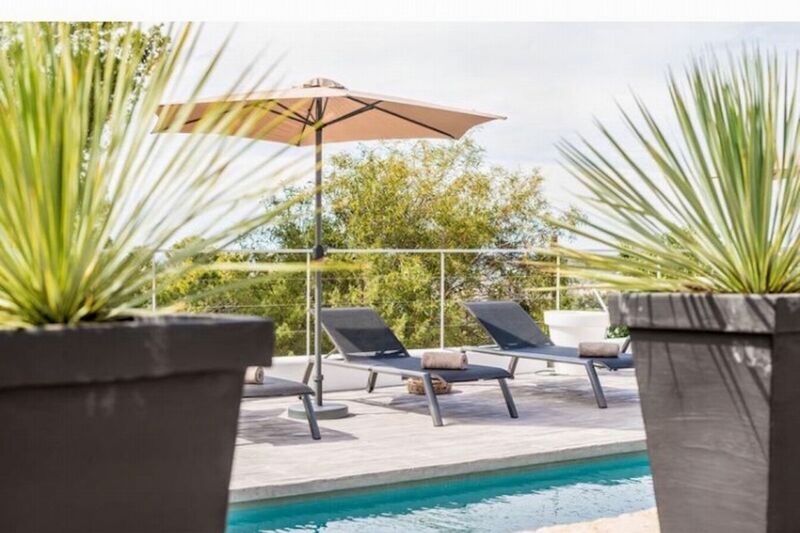 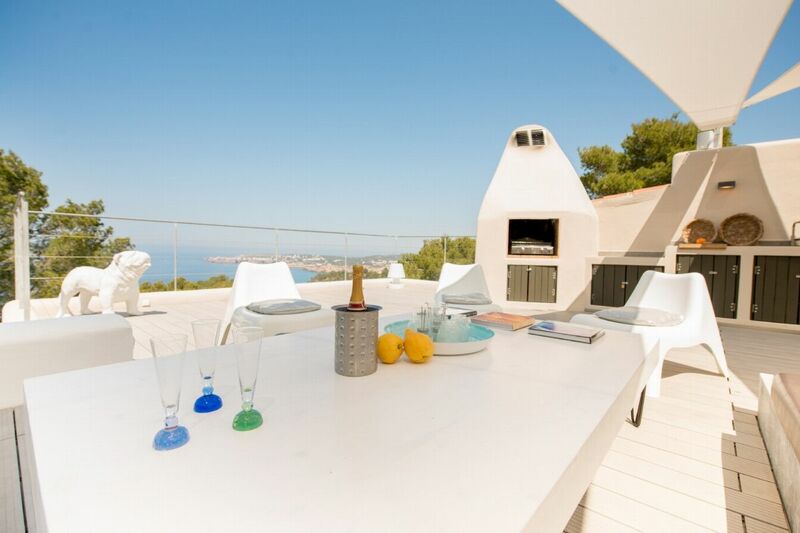 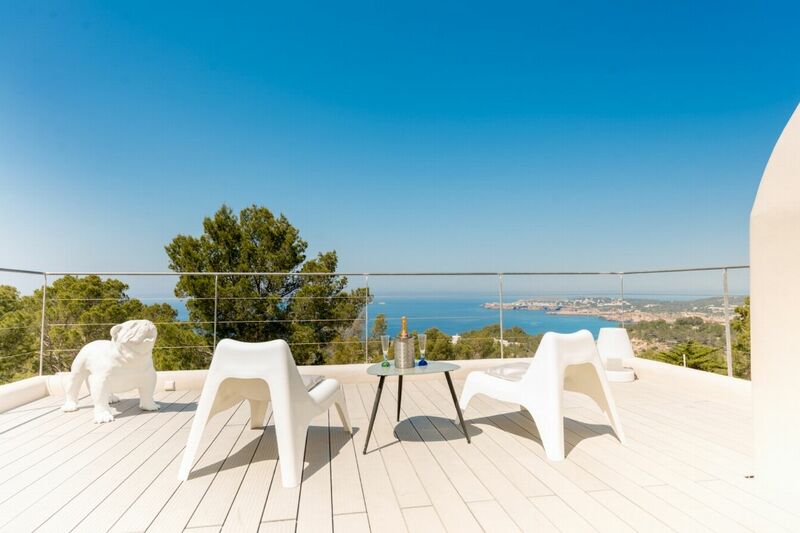 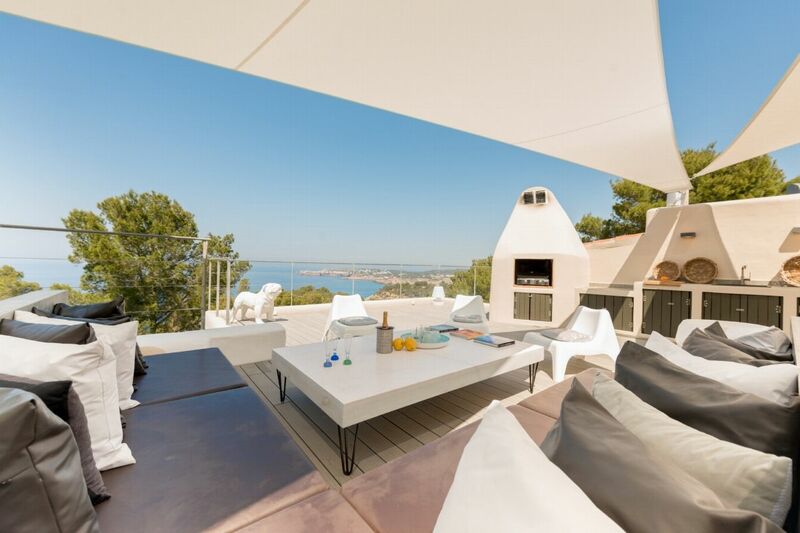 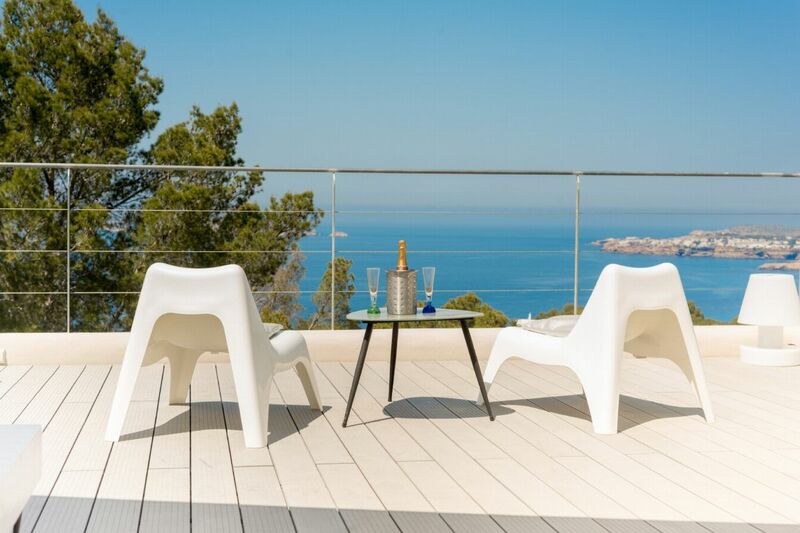 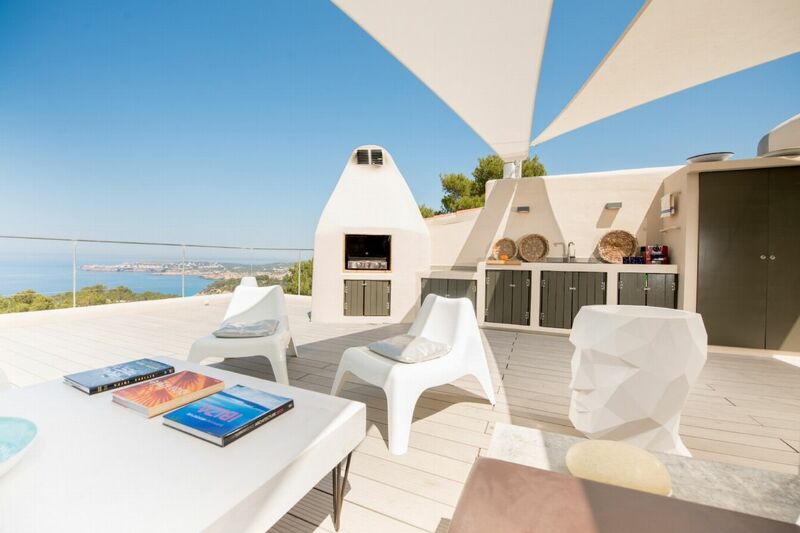 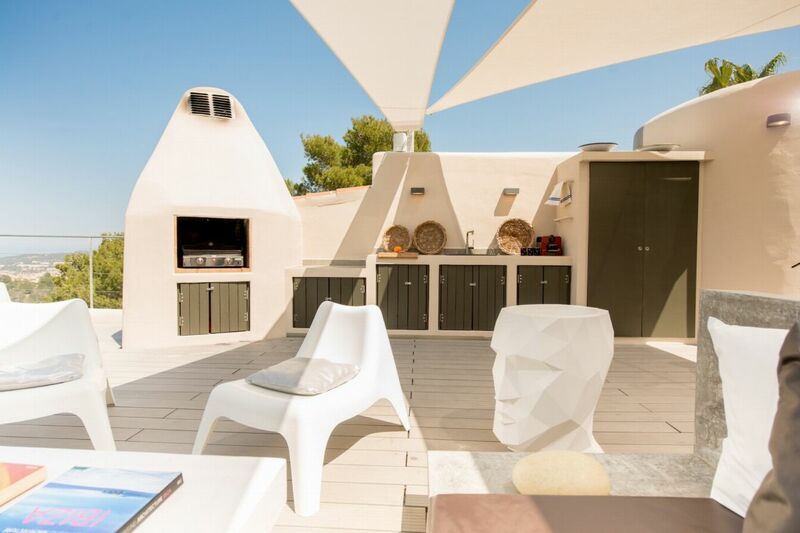 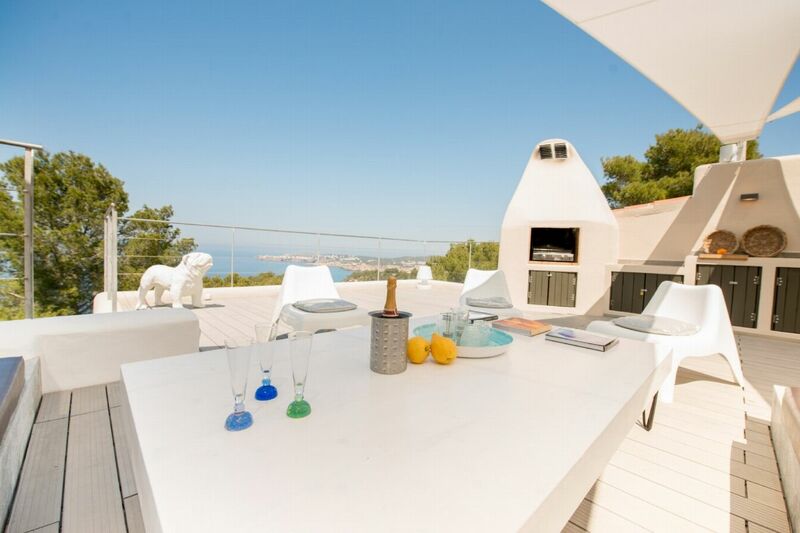 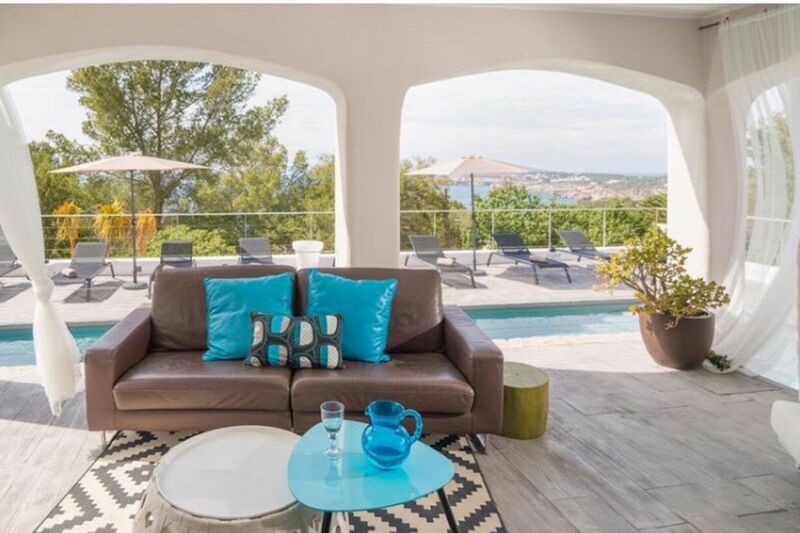 Incredible Ibizan villa with beautiful sea views from its extensive roof terrace. 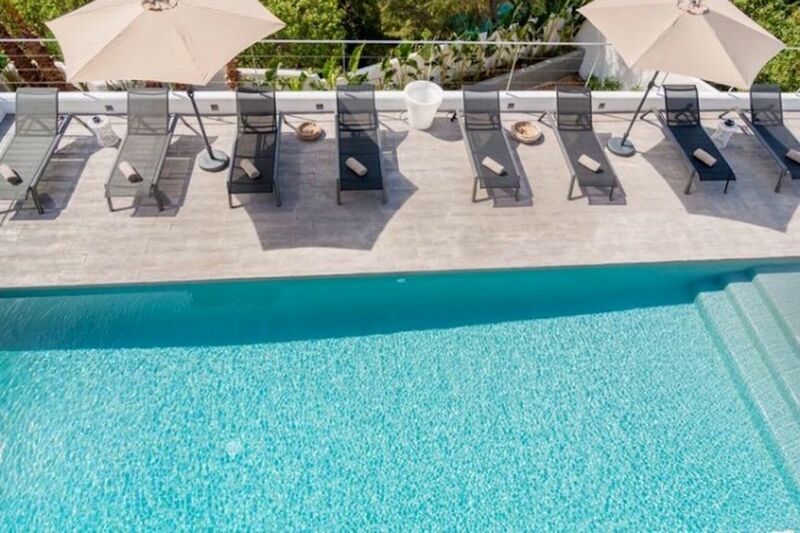 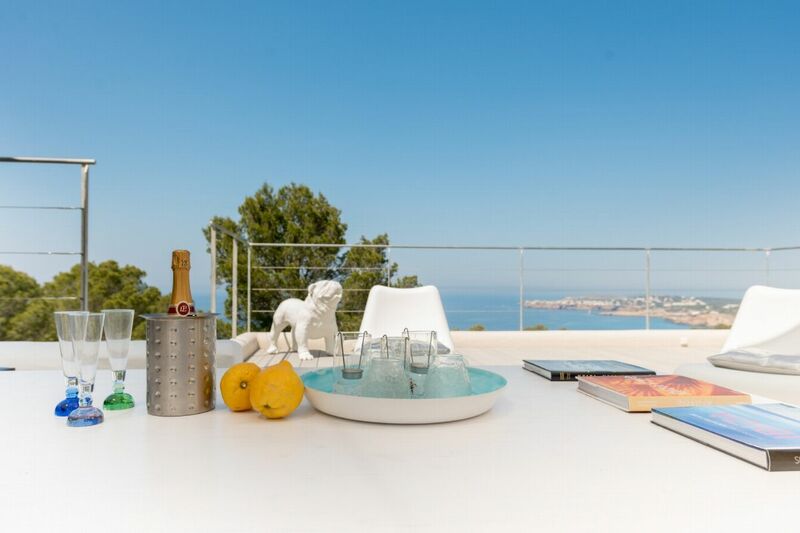 The pebbly cove of Cala Moli is a steep ten-minute walk from this beautiful property, and you can see its sparkling waters from the pool terrace and extensive roof terrace. 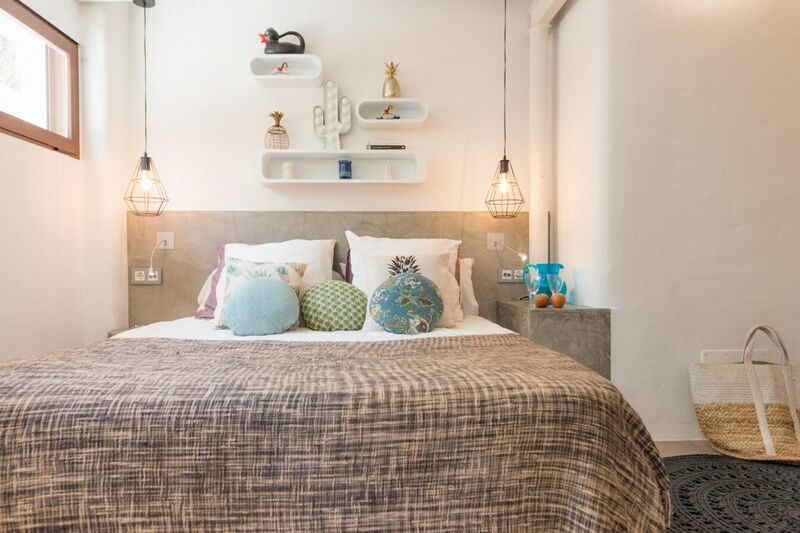 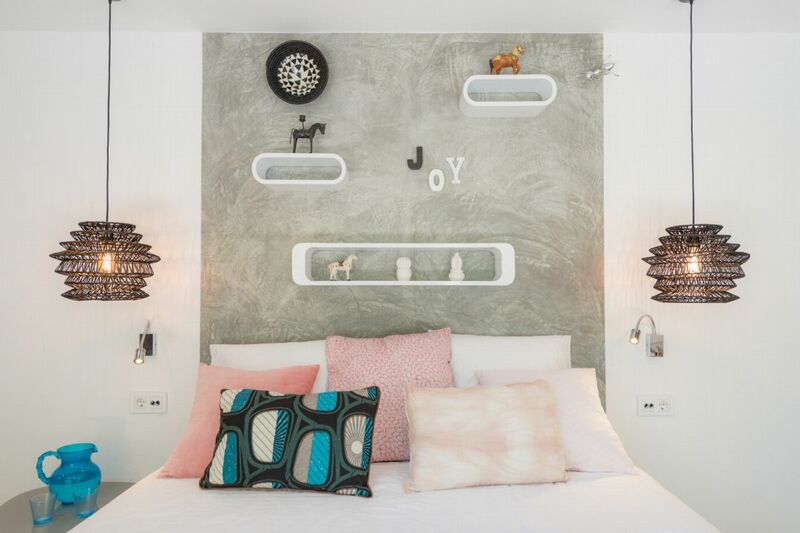 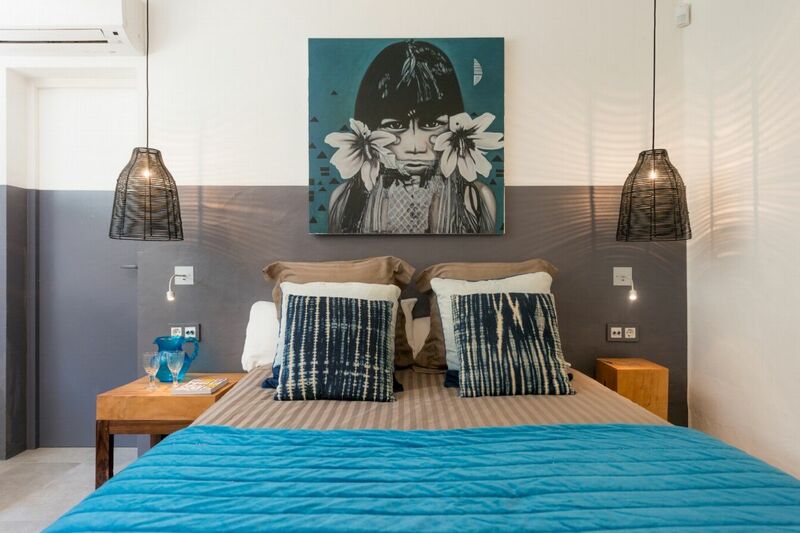 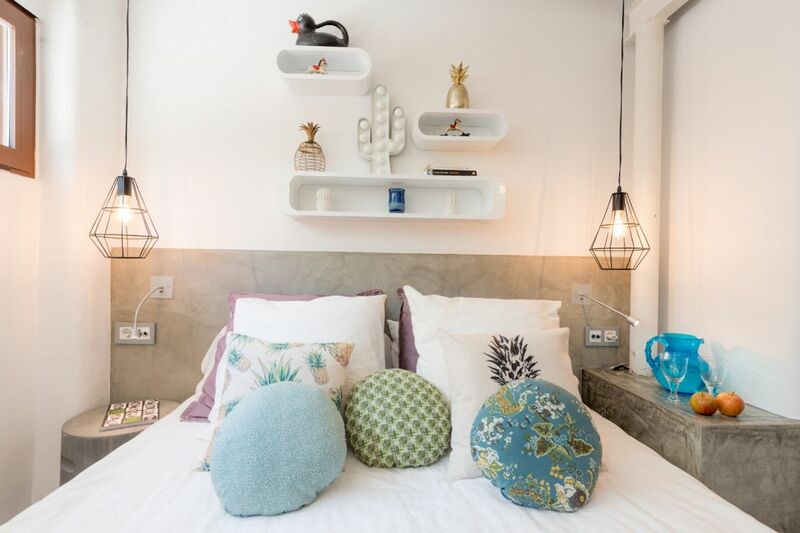 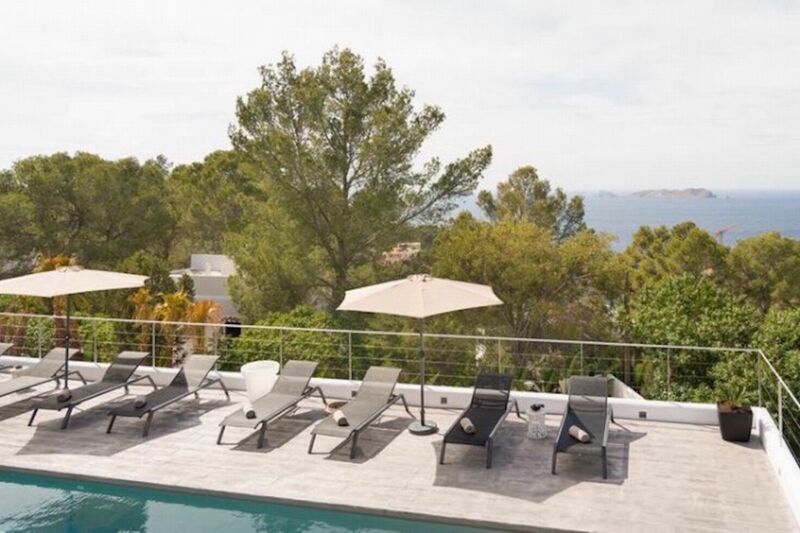 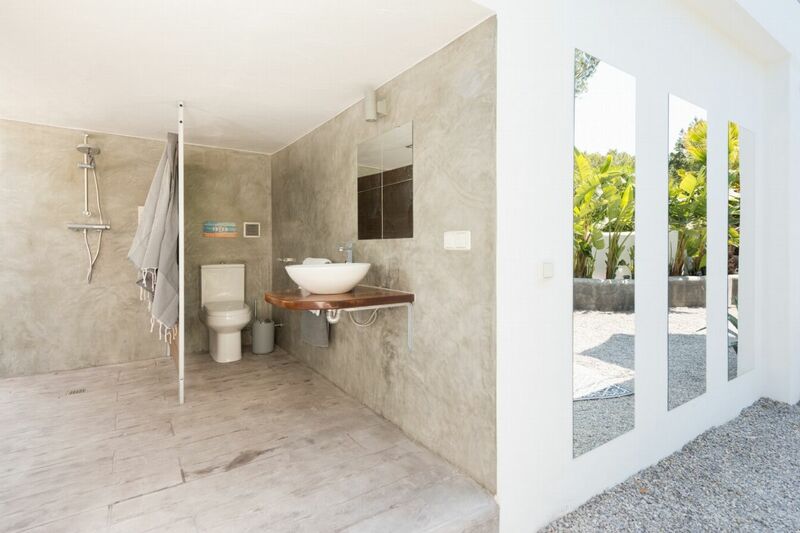 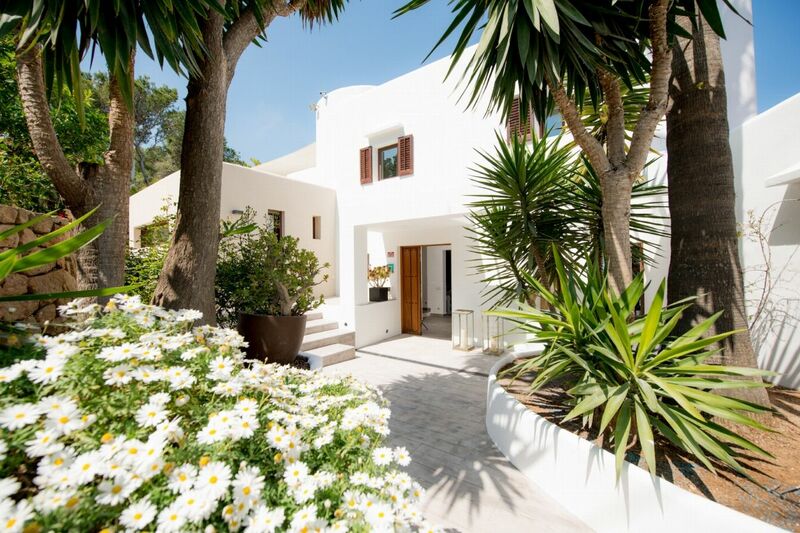 In a tranquil spot, ideally located on Ibizaâ€™s beautiful west coast, you are surrounded by amazing views of countryside and sea, but just a five-minute drive from Cala Vadella. 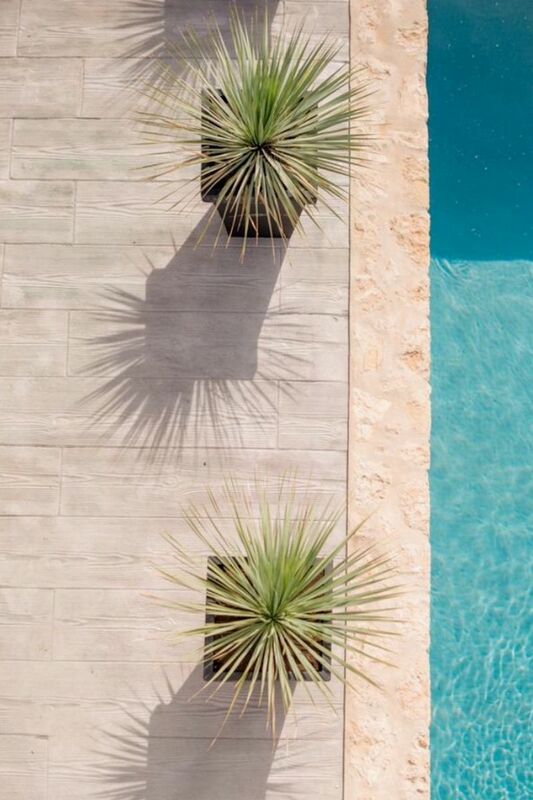 Set in lush gardens of palms and tropical planting, the house and pool offer a family-friendly combination of generous outside spaces and cool, spacious interiors. 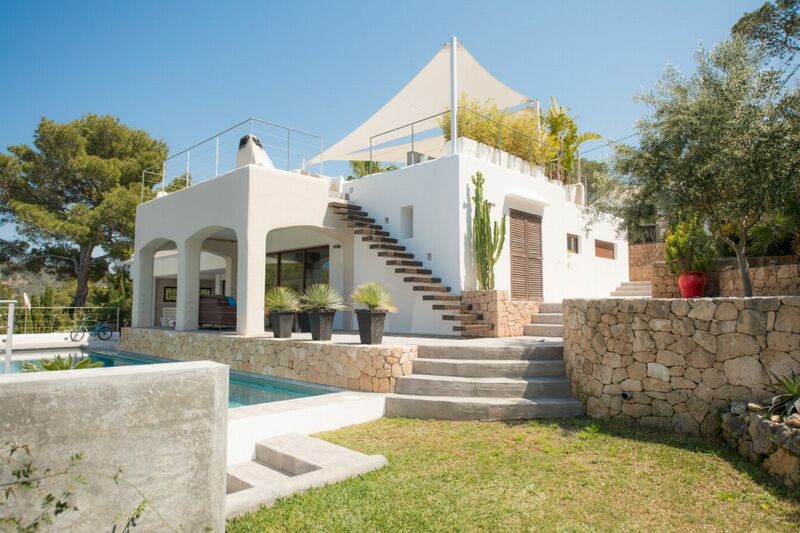 Low stone walls and gnarled olive trees lead to the sparkling turquoise pool and wide sun terrace lined with sun loungers. 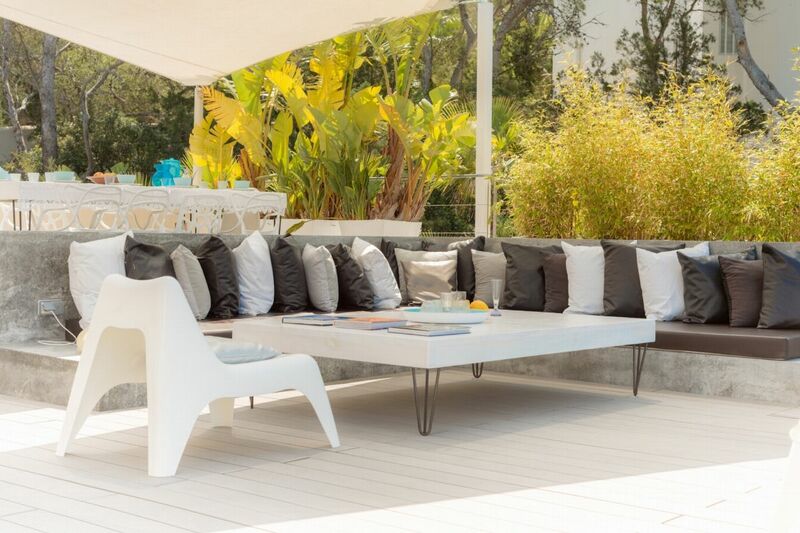 Overlooking the pool, a bleached wood deck offers shaded sofa seating beside the sliding glass doors to the main living area. 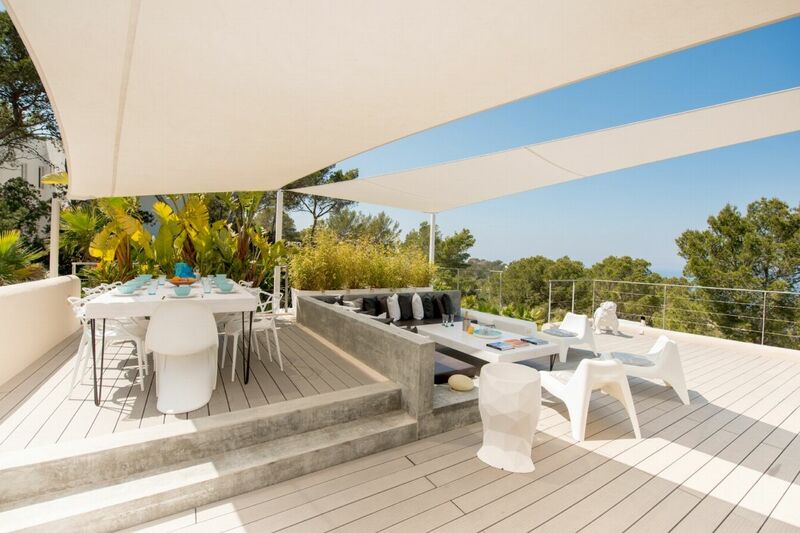 Alongside the deck, cantilevered steps rise up the side of the house to the upper terrace. 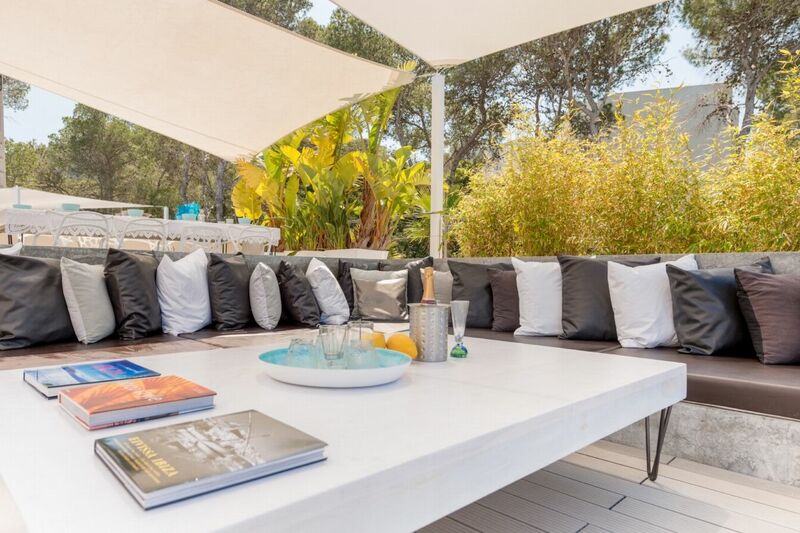 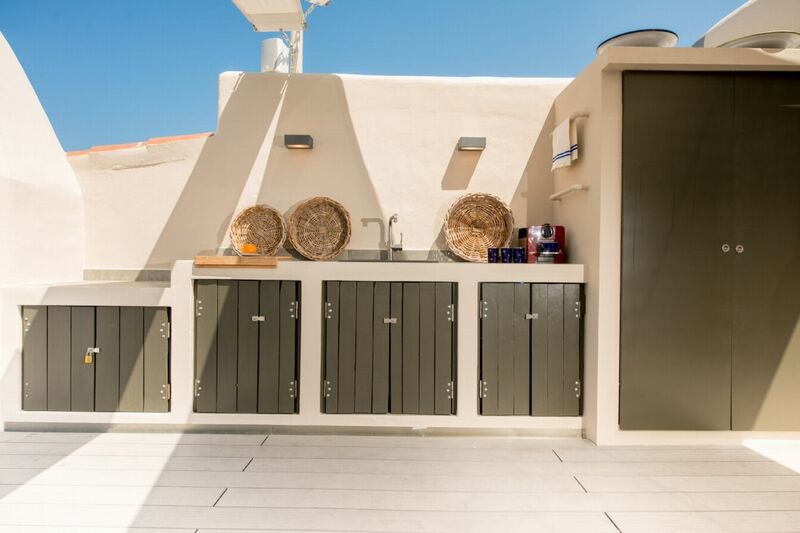 Here, a huge bank of sofa seating, a barbeque, a fully equipped summer kitchen and al-fresco dining table, seating ten, overlooks the pool and enjoys breath-taking sea views. 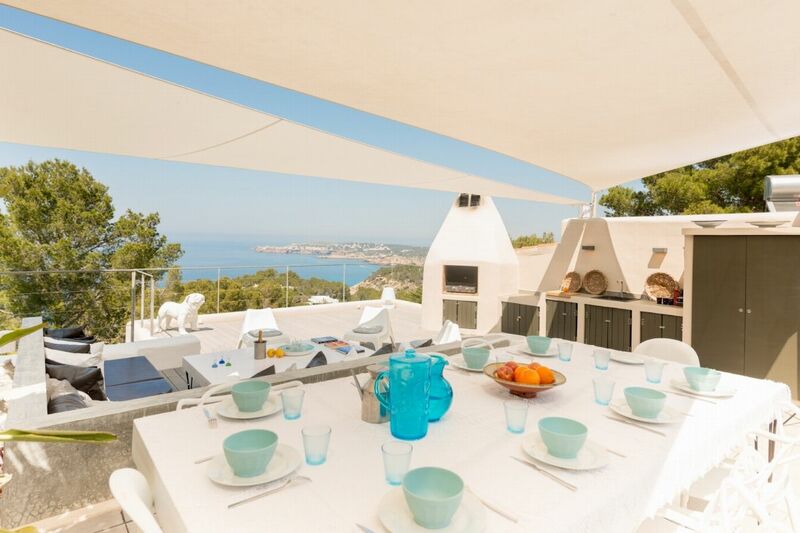 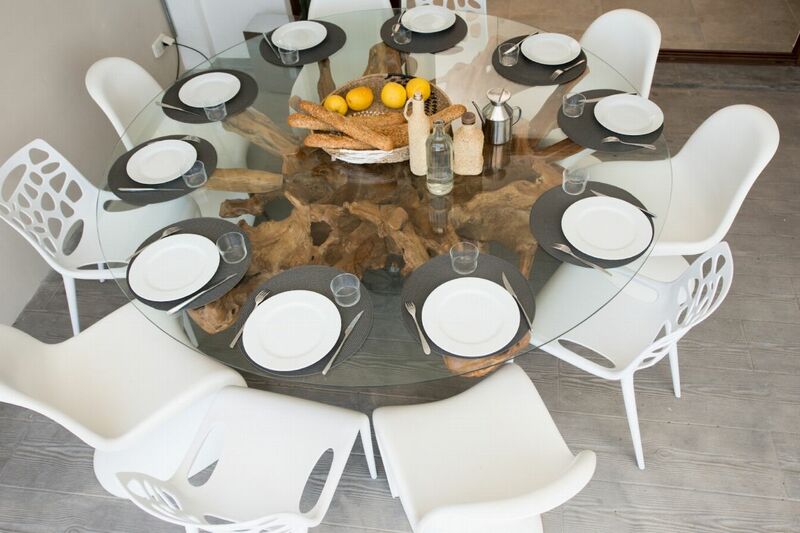 Enjoying a meal up here on a warm Ibizan night, in the pine-scented sea air, is an idyllic holiday moment. 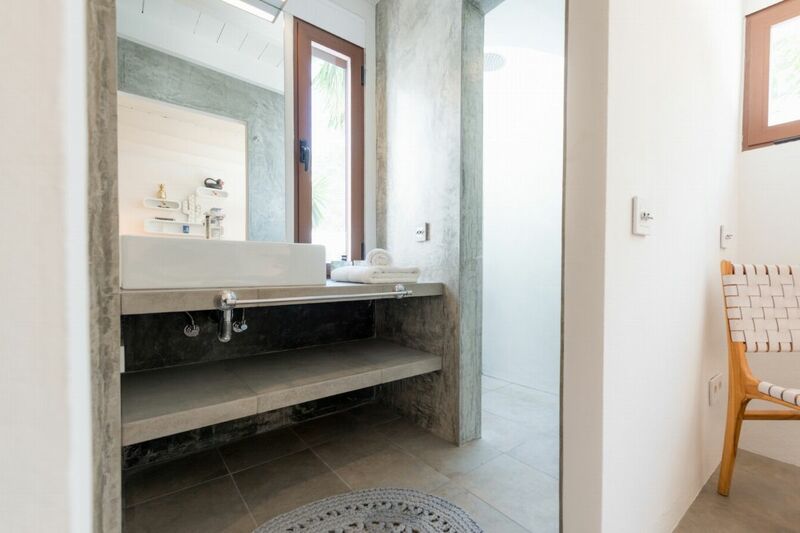 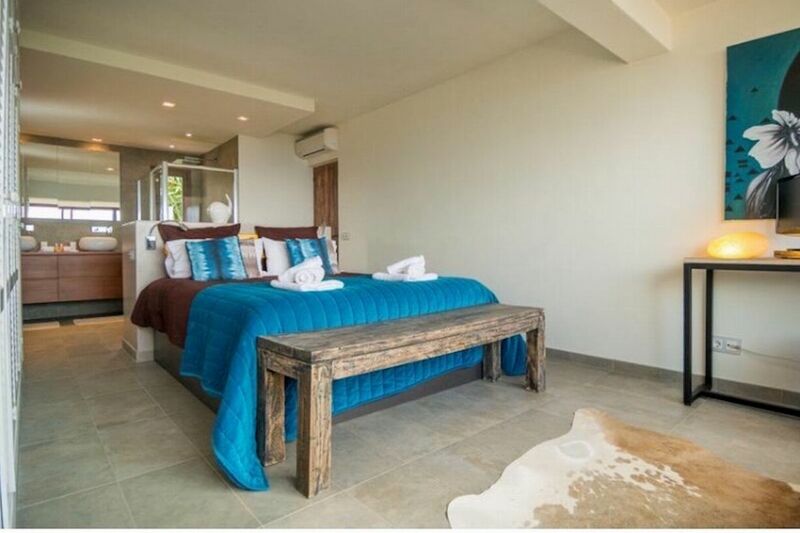 Inside, white walls, natural wood, and polished tile floors are softened with colourful, plush furnishings in ocean blues and soft sea greens. 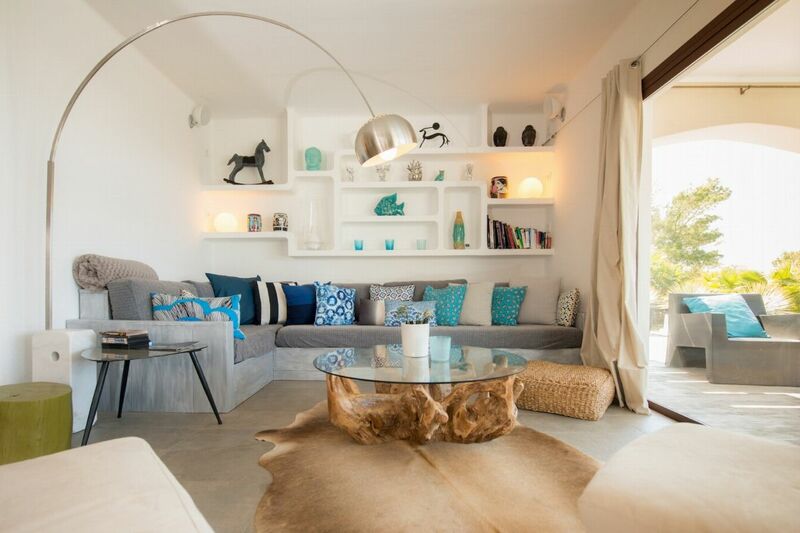 The living room is a cosy space, adjacent to a large, well-equipped kitchen with breakfast bar. 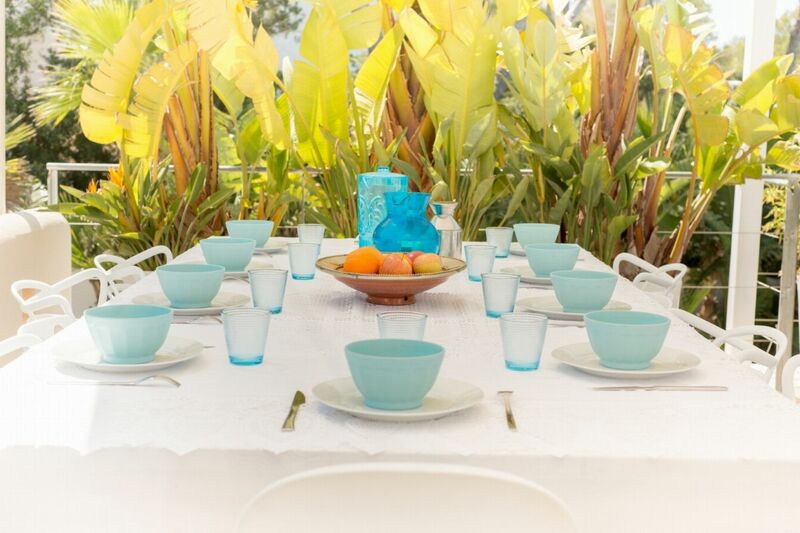 It opens up to a sun-drenched breakfast table, seating eight. 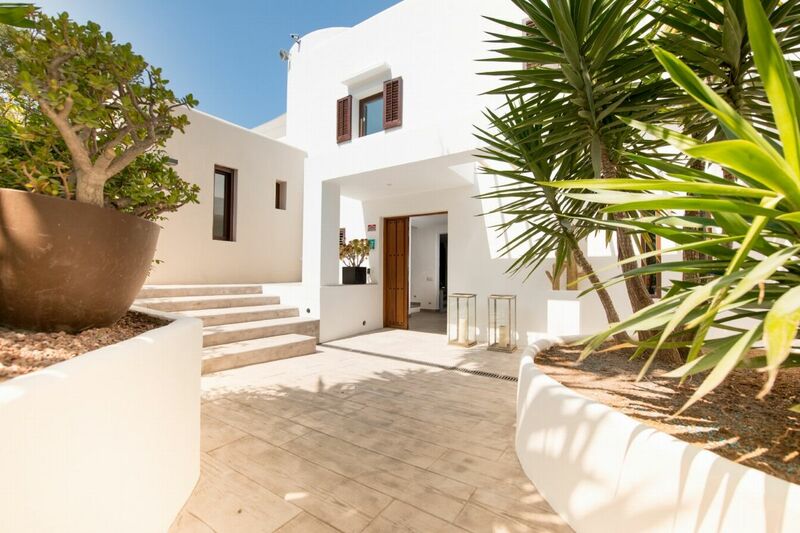 Four double bedrooms, each en-suite, are spread over the two floors. 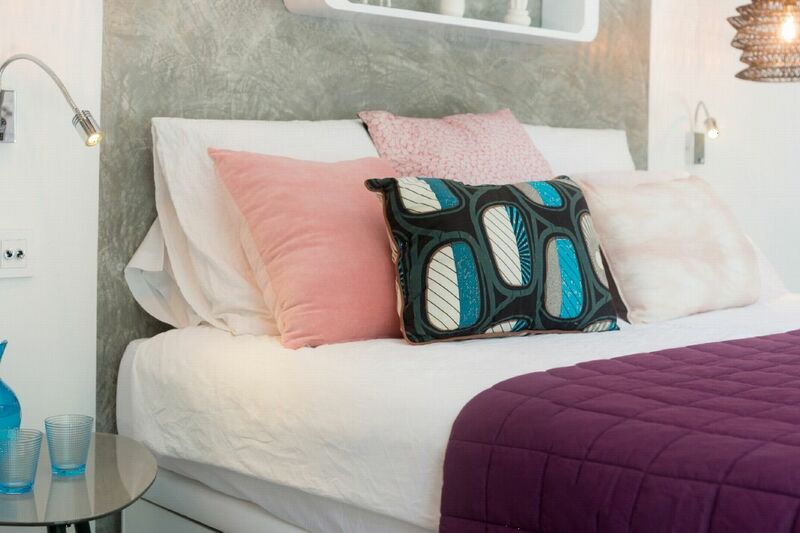 One double can be split into a pair of twin singles, if preferred. 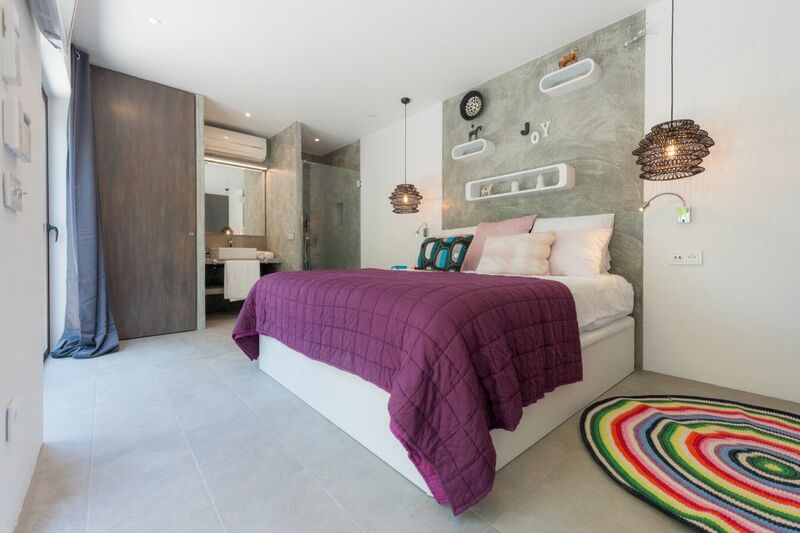 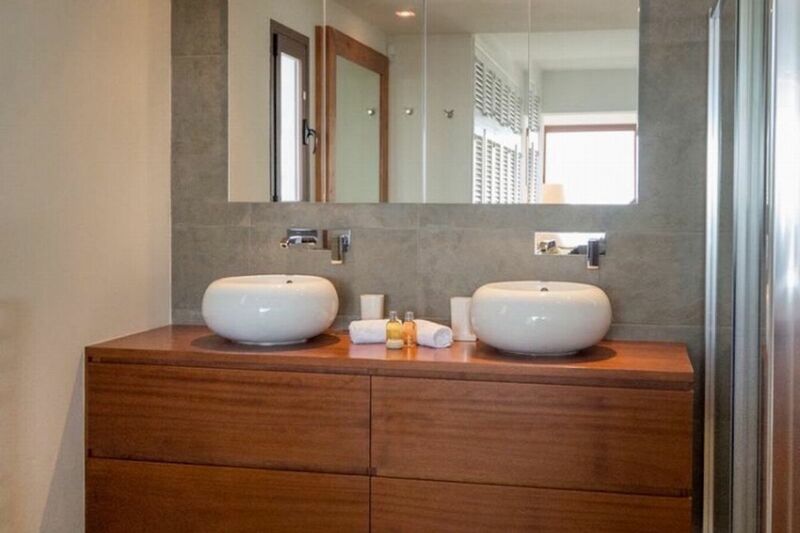 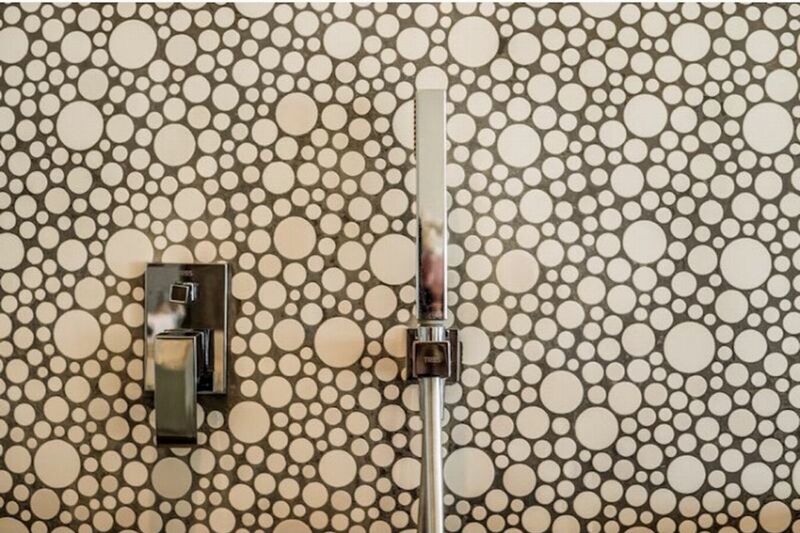 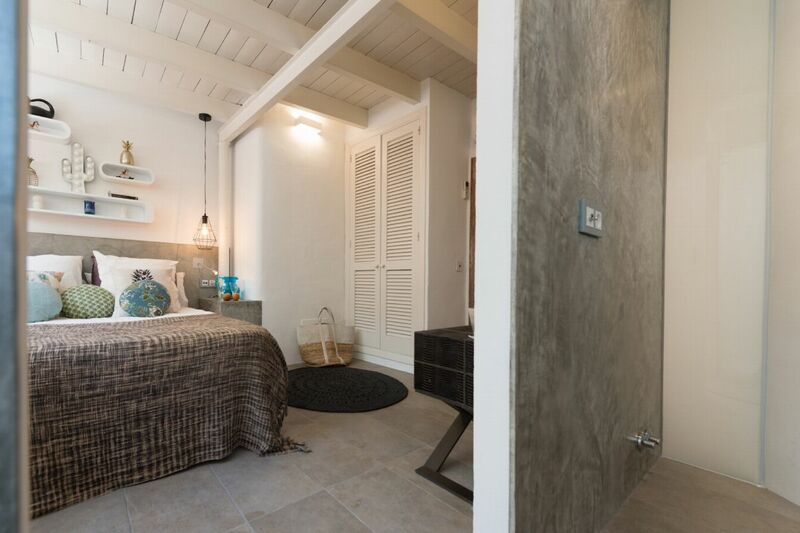 A further fifth double en-suite bedroom is accessed externally from a large private terrace. 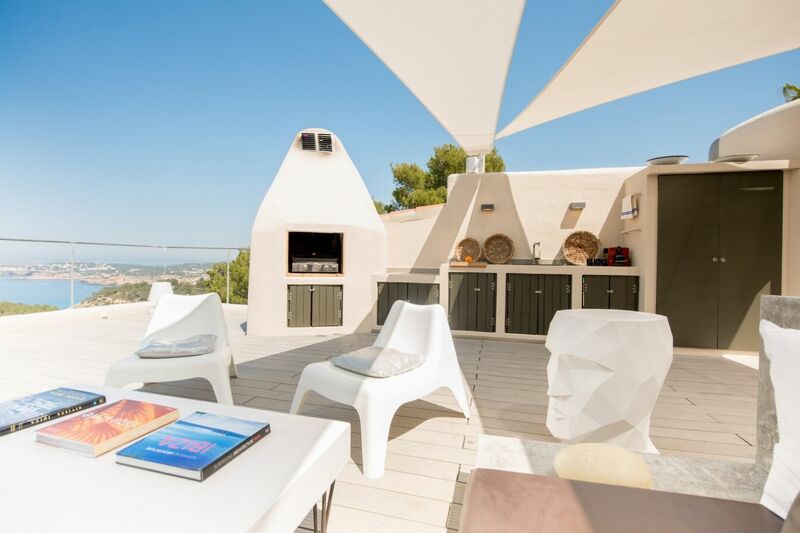 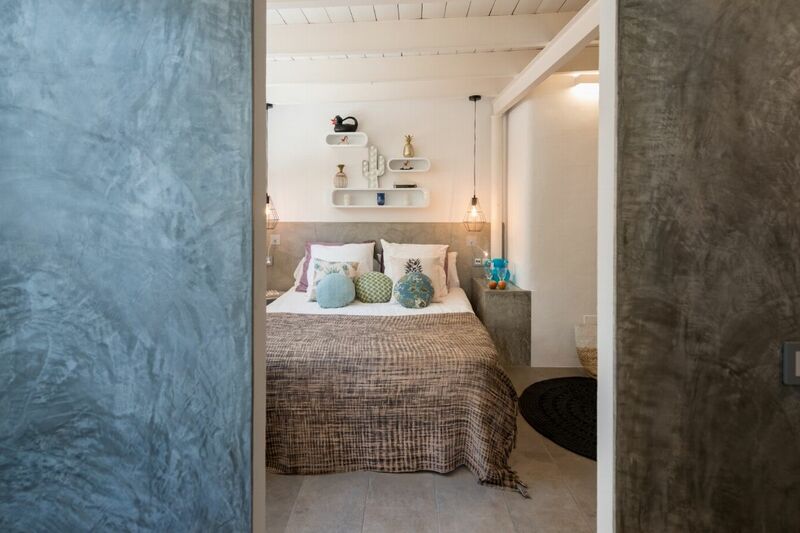 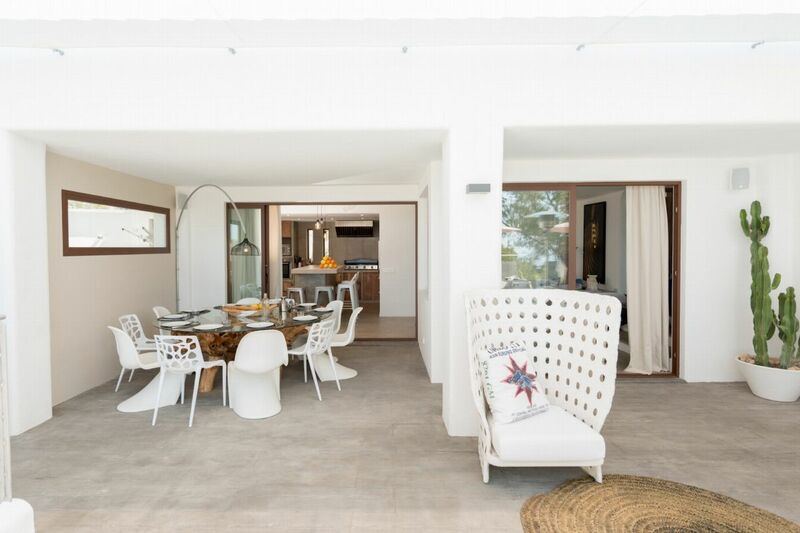 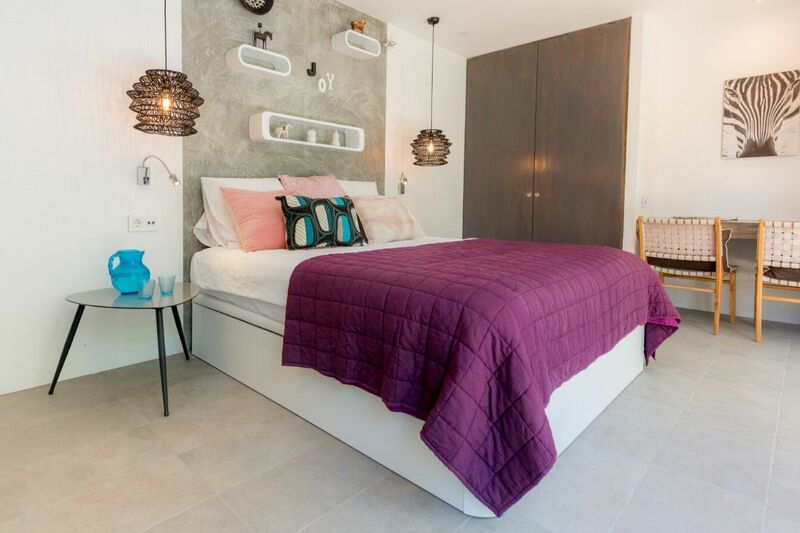 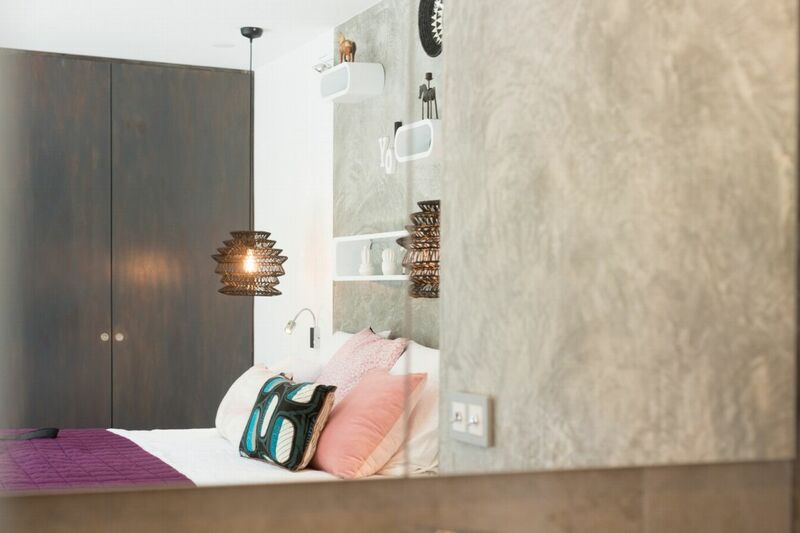 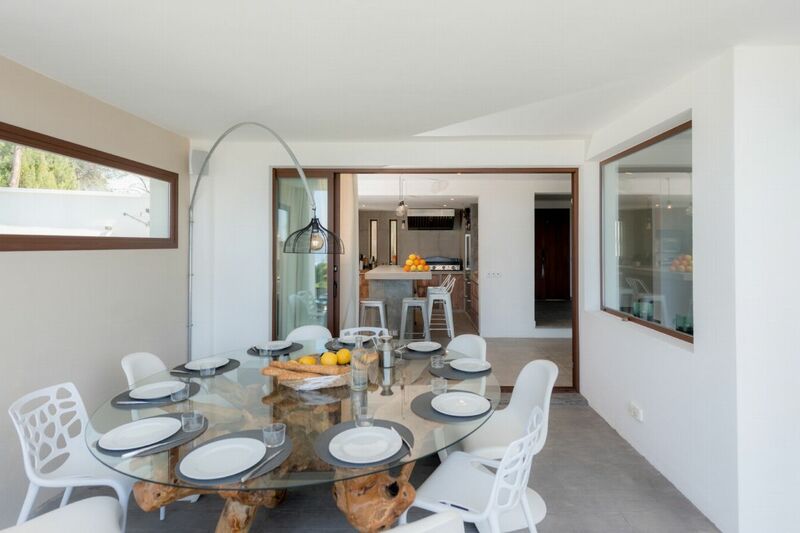 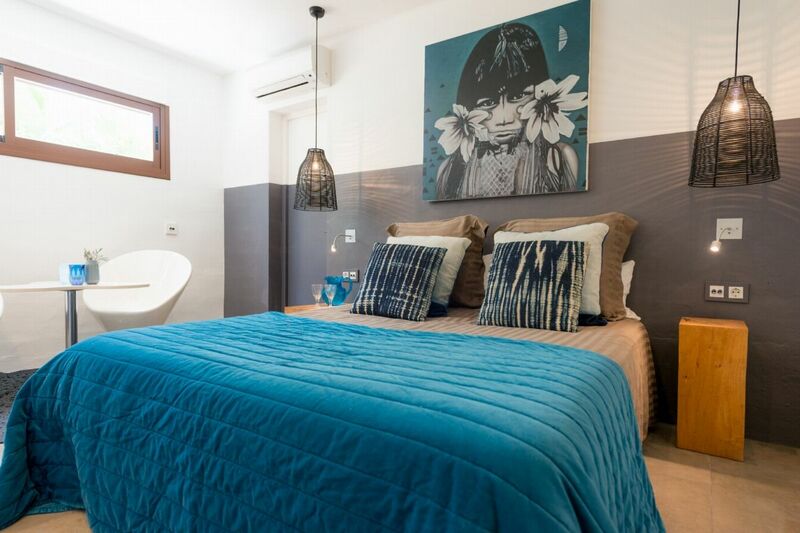 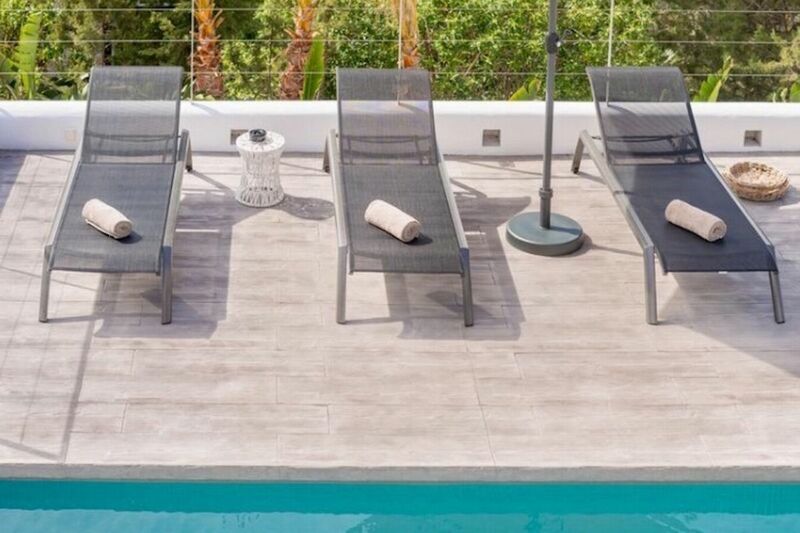 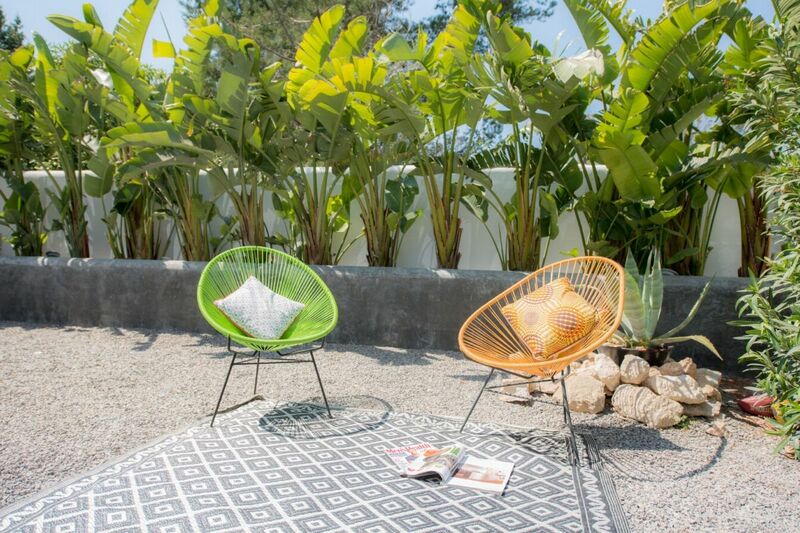 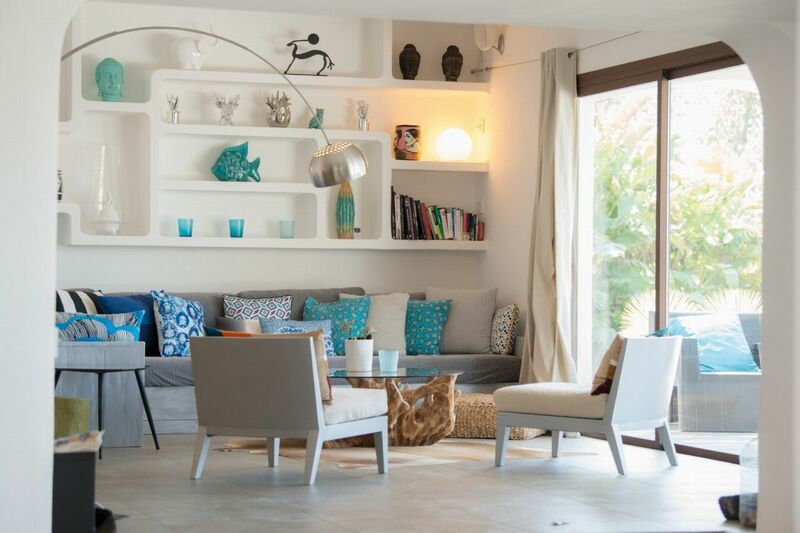 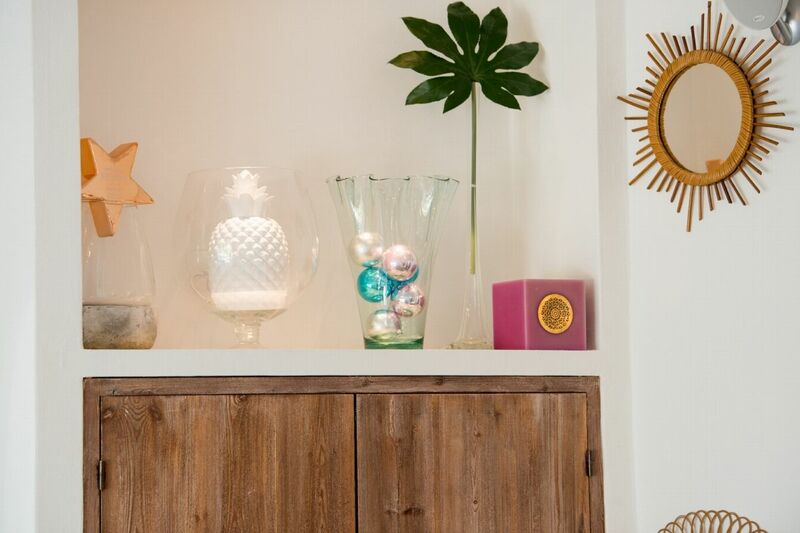 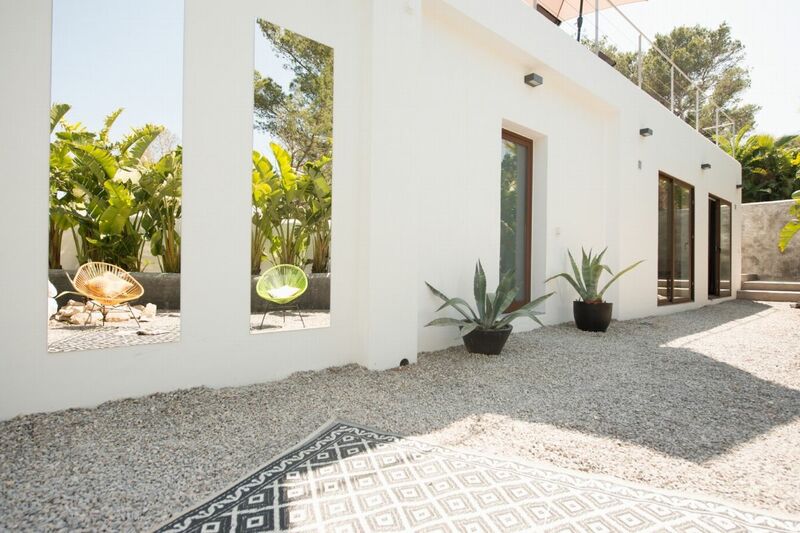 This is a versatile family-friendly Ibizan holiday home which enjoys a peaceful location on Ibizaâ€™s beautiful west coast. 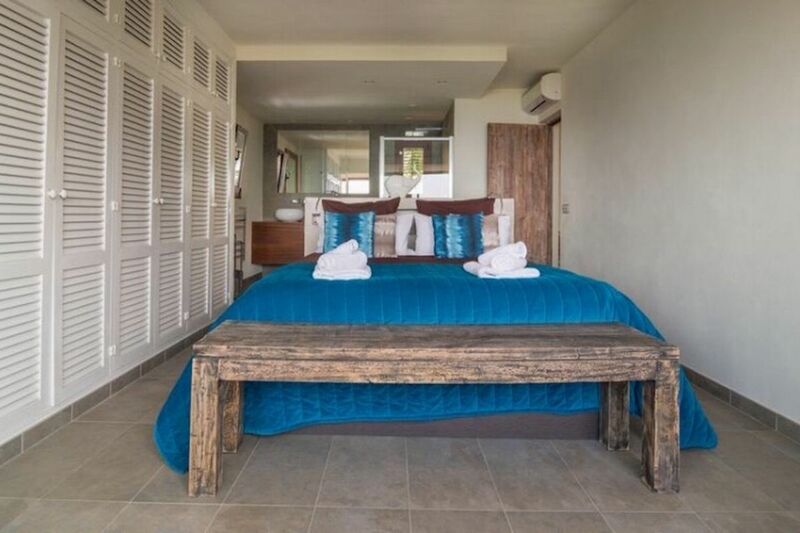 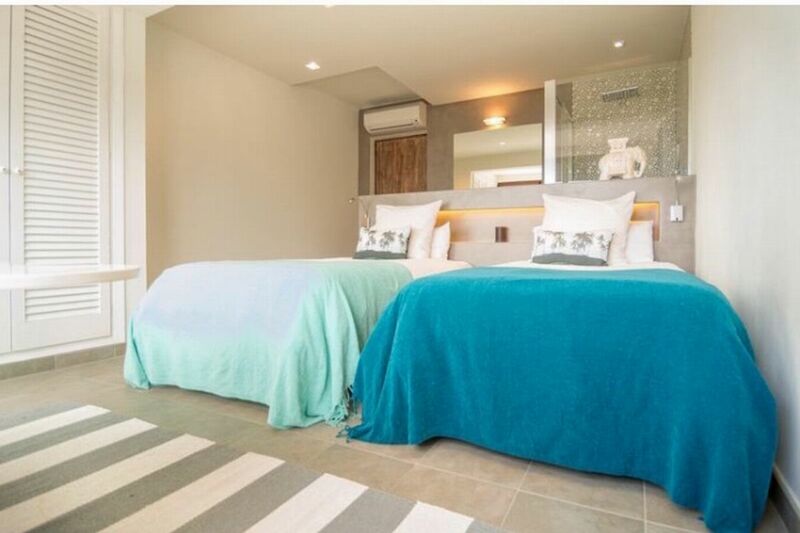 First Floor - Double bed (160 cm x 200 cm), en-suite bathroom, beautiful sea views, air conditioning. 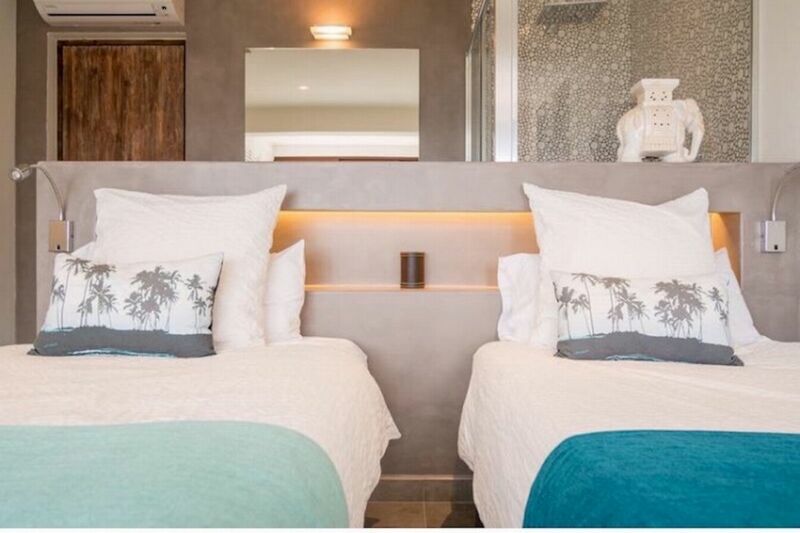 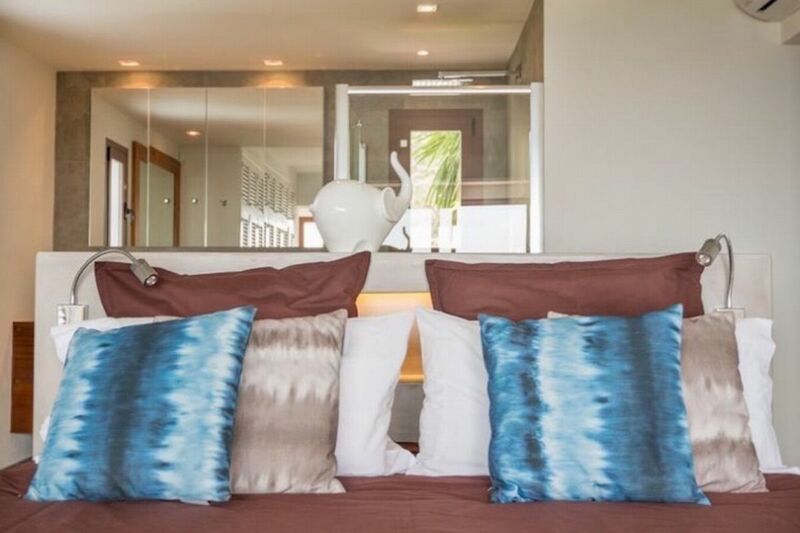 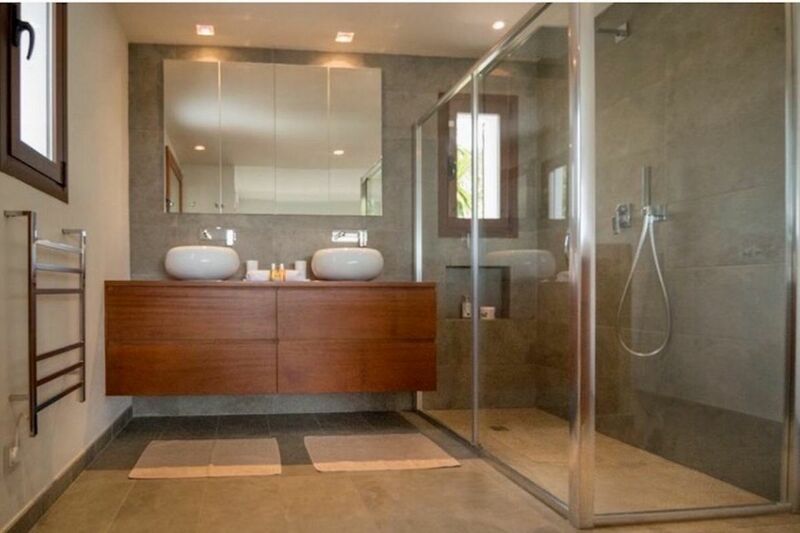 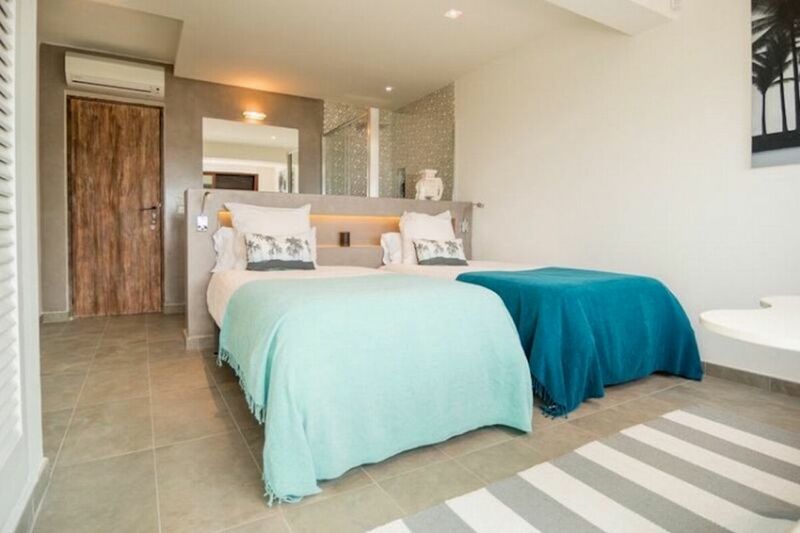 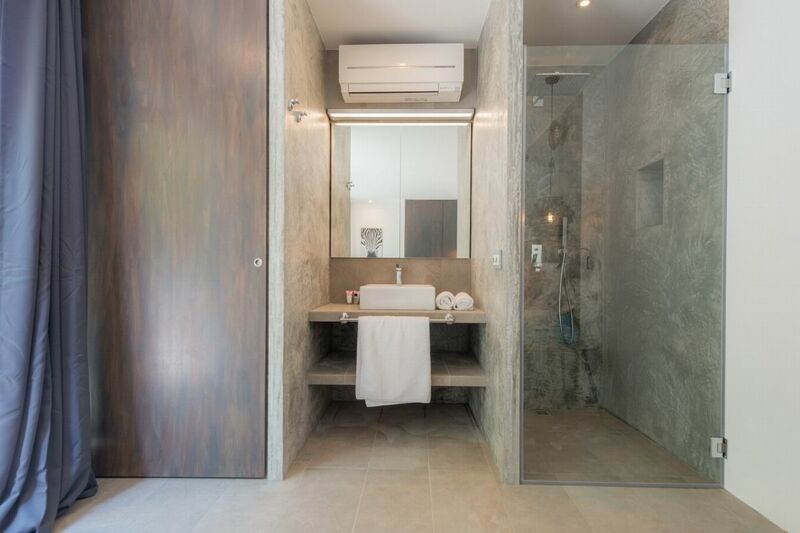 First Floor - 2 single beds (90 cm x 200 cm, can be transformed into a king size bed 180 cm x 200 cm if client prefers), en-suite bathroom, beautiful sea views, air conditioning. 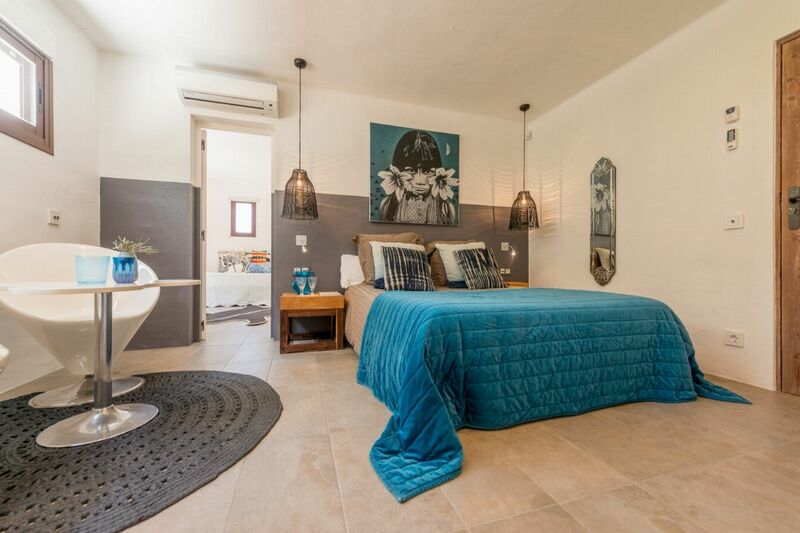 Ground Floor - Double bed (160 cm x 200cm), en-suite bathroom, air conditioning. 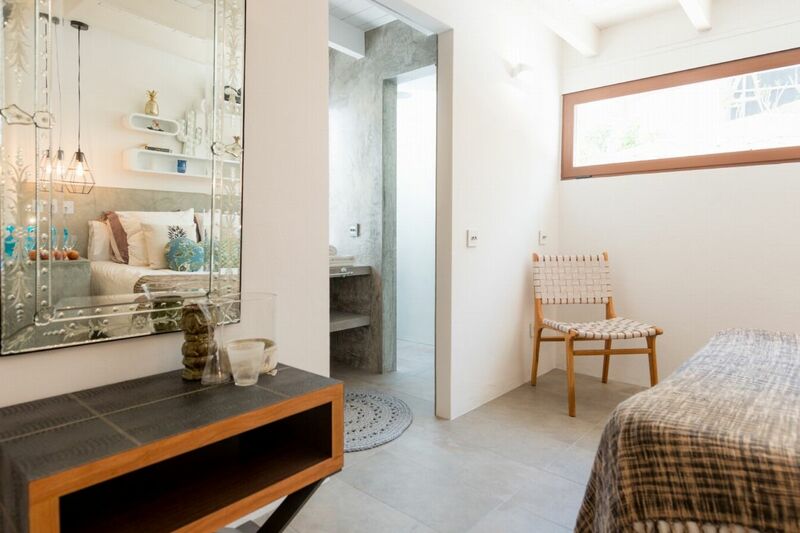 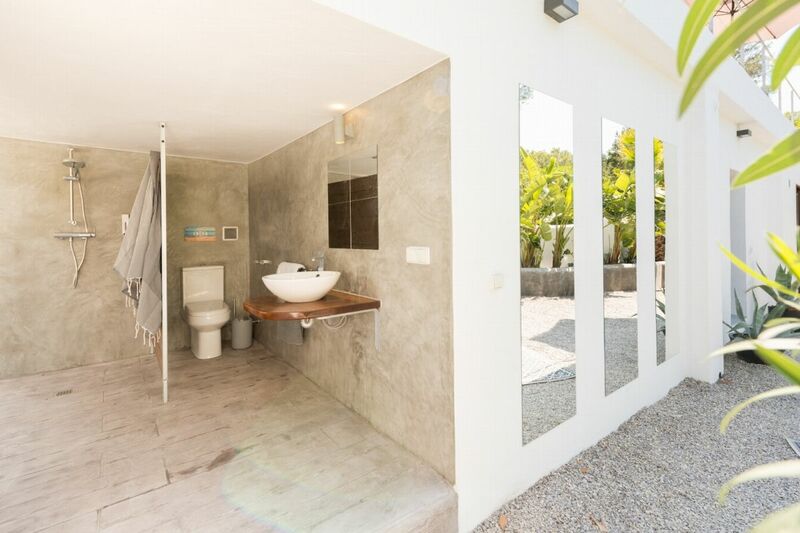 Garden Room - Independent bedroom with king size bed (180 cm x 200cm), en-suite bathroom, air conditioning, only accessible from outside with its own terrace.